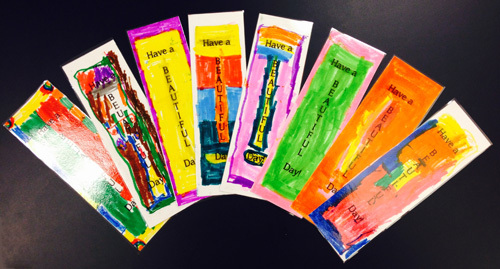 As part of our Kindness unit we made these bookmarks. 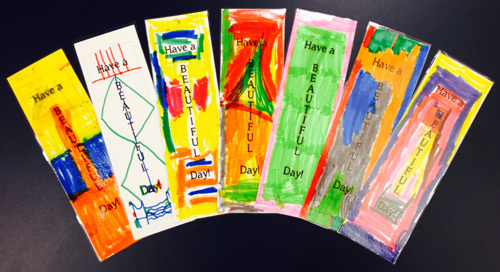 They're a little hard to see, but they say "Have a beautiful day!" Last week we hid them in some books in the school library as a lovely surprise for the other kids in the school! Before we made the bookmarks we watched this video twice. The kids were begging me to play it again. It's been around for a little while now, but in case you haven't seen it before, it's worth a listen. 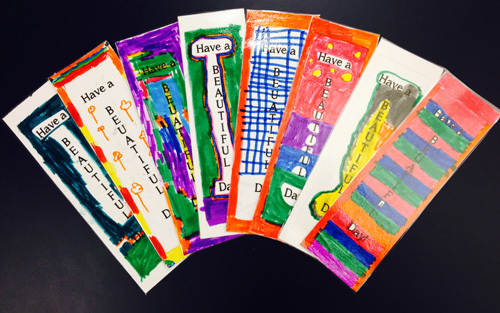 One of my favorite things is Bookmarks!!! I love that you put them in books in the library! Awesome! I LOVE this idea Barbara! You are so sweet and clever. What a blessing to the other kids at school and so unexpected! Thanks, Vicky! It's a great idea but I can't take credit for it. I found it somewhere while wandering around the internet. It's a keeper though and I'll do it again next year. During my RACK time, we leave notes in random library books in our library, but I love using your bookmark idea even better. I'll be adding that to my list.